Kevin has been in practice for 31 years. He joined Cooper & Scully in 2018 as the managing shareholder for their newly created Austin office after concluding 20 years as a founding shareholder of Uzick & Oncken. He has tried to jury verdict, more than 100 cases across Texas. Kevin has often been asked to step into cases outside of Texas via Pro Hac Vice. While the majority of his practice has focused on the defense of medical negligence cases, Kevin has also successfully represented plaintiffs in non-malpractice injury cases as well as commercial cases. At the pretrial stage, Kevin is known for meticulous preparation of his clients for deposition, conducting precision cross examinations of experts, and for thinking outside of the box with respect to ethically advancing his client’s interests. Kevin has been certified as a Diplomat in Medical Professional Liability with the American Board of Professional Liability Attorneys for the last 18 years. All diplomats must complete a rigorous approval process to establish full qualification as a specialist in professional liability. He holds an AV Preeminent Peer Review rating by LexisNexis Martindale-Hubbell which holds the distinction of the highest ethical standards and legal ability. 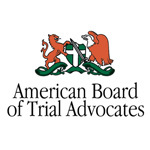 He has been honored as an Associate with the American Board of Trial Advocates (ABOTA). This invitation only organization, is bestowed upon trial lawyers who are of high personal character and honorable reputation. 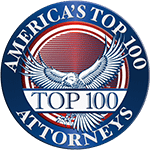 In addition, he was chosen as one of the Best Lawyers in America – Medical Malpractice Law (Defendants) and has been selected for inclusion in America’s Top 100 Attorneys for Southern Texas. 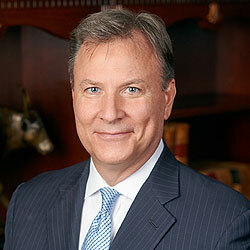 Kevin has been featured in the Texas Super Lawyers® list by Thomson Reuters Legal. He is a member of the American College of Board Certified Attorneys and is also a credentialed mediator with the Texas Mediator Credentialing Association. In that regard, he has served as the neutral mediator in more than 75 cases involving serious injuries, toxic torts, products liability and commercial matters. Kevin is often invited to speak at Continuing Legal Education seminars and has also frequently given presentations at Continuing Medical Education seminars for physician groups and hospitals. For a number of years he authored a recurring column in a medical malpractice carrier’s client publication offering commentary and risk management related practice pointers for clinicians. Kevin and his wife Diane have been married for 31 years. They raised their 2 children, Kate and Jeff, in San Antonio, spending countless hours volunteering with their schools, sports and dance organizations, and many charities in the community. Residing now in Austin, they maintain a commitment to charities that provide food, shelter and education for those in need. They are members of St. John Neumann Catholic Church and Barton Creek Country Club. Search for another Professional Agnew, Amy L. Allred, William F. Berger, Roger Bolcom, Charles H. Burke, Kyle M. Byers, Nisha P. Cooper, Elliott T. Cooper, Jackie S. Cooper, R. Brent Davidovitz, Moris Davis, Derek S. Faubion, John C. Faust, Diana L. Frederick, Summer L. Hines, Eric W. Johnson, Wes G. Jones, David H. Koenig, Julie M. Kropf, MD, JD, Beth Langley, John Law, Alan Lindsay, Rachel L. Matthews, Lanette L. Nelson, Ashley Nelson, Chad Oncken, J. Kevin Oncken, Katherine Rees, R. Douglas Reist, Jana Starling Robberson, Michelle E. Scully, John A. Shehane, Julie A. Shuchart, Fred L. Smith, Lauren L. Smith, Stephen Sohlman, Tara L. Staub, Derek Stendell, Aaron G. Sutker, Cory M. Walton, S. Hunter Williams, Benton Witmeyer, Robert J. Wright, Gordon K.